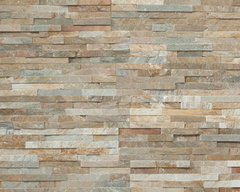 what is that wall made of and where is it sold? Who makes the chandelier (where could I find one for my home)? Did the oversize bulbs come with it? we make a similar style light... check out our KADUR pendant. 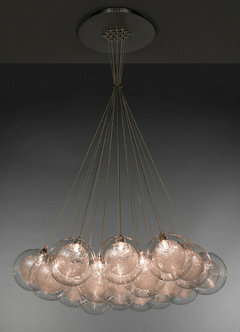 Ilde Max chandelier, designed by by David Abad, 2002. Bulbs included. You can find it at YLighting. PANEL — Nov. 12, 2011, 3 p.m.The Return of ModernismMuseum of Arts and DesignNew York, NYSecure a seat at a panel discussion exploring why the go-to Modernism style from the 1960s, including the rise of designers Russel Wright, Eero Saarinen and Charles and Ray Eames, is now experiencing a unique revival. Organized by the New York School of Interior Design in partnership with the Museum of Arts and Design, the panelists include Vladimir Kagan, Jack Lenor Larsen, Evan Snyderman, and Anna Hoffman. Engage in the discussion as the panelists — who were involved in both the original revolution and current revival — offer answers to the question, "Why now?" The panel will be moderated by Judith Gura, Professor of Design History at the New York School of Interior Design.No reservations required; seating is on a first-come, first-served basis.More design events: Oct. 7-28, 2011, Oct. 14-Nov. 4, 2011What's on your calendar this month? Let us know about your favorite upcoming design events below! You: Love classic midcentury modern designYour table: Saarinen-inspired roundLovers of midcentury modern gravitate to the Saarinen table for its retro style. The original comes with a marble top, but there's an Ikea version in plastic for those on a budget. The bright white top and streamlined tulip base in any material is cheerful and pairs well with so many different types of chairs and lighting.